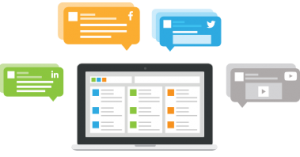 Social media management is dedicated for marketing departments and organizations to publish to social media platforms. Users can post to many social media platforms at once, respond to customer inquiries quickly, and work in teams without creating any duplication of efforts. Social media management has grown in recent years from purely offering publishing features to including social media monitoring and analytics integrations bundled into their products, though there are many standalone social media monitoring products on the market. Based on their own needs and budgets, clients should decide whether a broader marketing automation suite or a pure social media monitoring or analytics tool would better fit their needs.